I adored these Irish Spring commercials. Was I the only one? The soap looked so cool, with the green marbling throughout. The Irish stereotypes were as rich as a shamrock shake, from the thick purring brogues to the Irish wool sweaters. And best of all, they for some reason took KNIVES and cut slices off the soap! Who didn't want to take a sharp knife into the tub after they saw one of those ads and just shave and whittle their own soap? I haven't really missed bar soap since it made its inevitable slow passage towards the exit, since body wash is so much nicer, but if I did have to suddenly start using it tomorrow, this is the soap I would want. And if you think it was kind of a marker of our generation, you are right. It came out in 1972. Another interesting tidbit from the Wikipedia entry: The original Irish Spring scent, the one I am pretty sure you are remembering right now, was called "Ulster Fragrance" internally at Colgate-Palmolive. But now they have a ton of other scents with names like "Moisture Blast" and "Micro Clean." I loved the ads because they always had incredibly hot guys, heh. 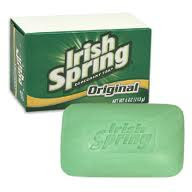 The big problem with Irish Spring is that it always melts in the shower (or at least it used to). If left too wet, the bar disintegrates into a blob! Yuck!